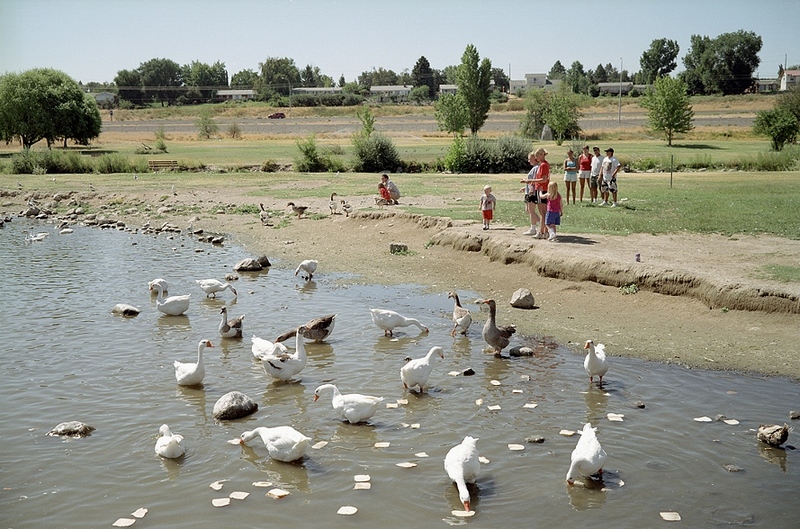 Justin Newhall’s photography has been exhibited both nationally and internationally, including solo, two- and three-person exhibitions, at the Museum of Contemporary Photography (Chicago), Galerie Lichtblick (Cologne), Franklin Art Works (Minneapolis), and the Minneapolis Institute of Arts. 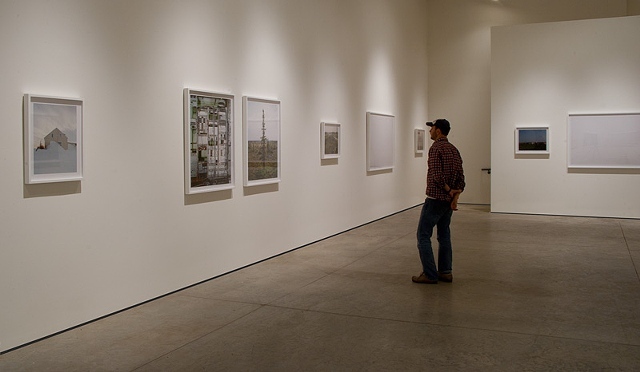 His work is represented in numerous public and private collections, including the permanent collections of the Museum of Contemporary Photography and the Walker Art Center. Justin is based in Minneapolis, Minnesota. He received a BFA from the Minneapolis College of Art & Design and an MFA from the University of Minnesota. Aperture has published an individual title of Newhall’s work. Newhall is represented by Weinstein Gallery in Minneapolis. For more information, contact newhall.info@gmail.com. MPB: Your work involves myths and history, and in your Lewis and Clark series, many of the photos depict “history” as it relates to opportunities for tourism and commerce. In America, public knowledge about her history is a commercial industry in as much as commerce equates America’s national pride. For you, is there a semblance which stories from history sell, and which stories people are attracted to, and how those stories are spun over time? JN: My work in Historical Marker revolved around the 200-year anniversary of the Lewis and Clark expedition. One of the things I was interested in with that project was exploring how we tell or sell our historic past. It is usually incredibly oversimplified and often hyperbolic – animated dioramas, reenactments, etc. As a kid visiting these places, I can tell you it did little to shed light on history in any thoughtful or educational way. I also wanted to juxtapose those often absurd images with images of the geography itself, which is often unremarkable. Many historic sites and monuments belie the significant events or histories that actually took place there. MPB: Contrarily, photographing up in Churchill, Manitoba is more about hunting down the mythology that inspired Gould. Whatever community there was, it was a fringe-society without the glamour of the heroic American mythological epic. Your series, Northern Studies, is less about a public or collective connection to history, yet, like any other story, the landscape’s narrative is mysterious and compelling. Is there a reason why you started the series as it relates to the hyperbolic tourism found in Lewis and Clark’s legacy, or the shared fetishism found in Axis and Allies? JN: With Northern Studies I wasn’t so much interested in “hunting down” the North that Gould portrayed in his experimental radio documentary as I was in finding a way to translate its essence into visual form. As for how it relates to my Historical Marker images, I would say that both involve following someone else’s path. And in both those projects and in my Axis and Allies series, I was interested in history – past and present. Also, in all three bodies of work, the landscape figures in or looms largest. Even in Axis and Allies, the Midwestern landscape, full of buckthorn and honeysuckle, becomes a character. MPB: What’s an experience about an image you had difficulty making, and could you describe what potentially distracted or diluted the image before you were happy with it? JN: With Northern Studies I had many difficult experiences making images. My first of several trips to Churchill, Manitoba (where the Northern Studies images were taken) involved a 10 day trip (five of which were on a train) with me shooting around 100 rolls of film – and I didn’t like any of the images I made. There were a few images from that trip with promise, but I could tell I just needed to figure out a better way of picturing them. On my next trip I switched from a medium format to 4×5 so I could get more descriptive power from the images and that helped a great deal. The worst part about shooting in the region was the cold in the winter (one trip the mercury never made it above -30 F), which made taking pictures with my 4×5 almost impossible. And add on top of that that the very real possibility of a polar bear attack. The summers weren’t much better – I still had to be worried about polar bear, but the real menace was the bugs. You can’t even imagine how insane they were. It was the Boundary Waters times ten! MPB: Is the purpose of your work satire, or to critique? Or both? MPB: Your previous series Axis and Allies explores history as consumption: the rituals of subculture, nostalgia, and respect ultimately compel larger bodies of people-groups to reenact war battles. How much is spectator-sports? Education? 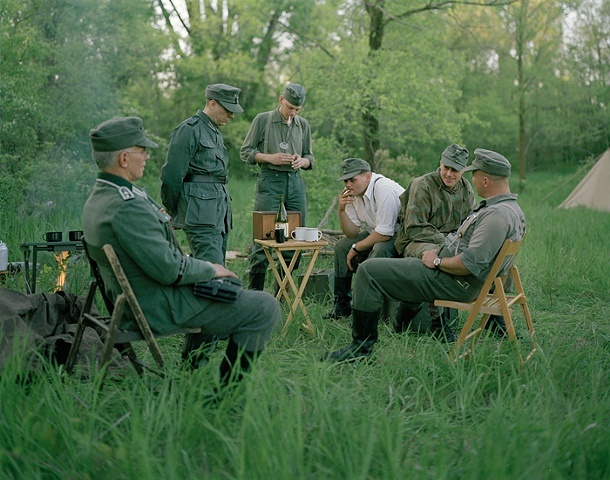 JN: Many people who participate in reenactments feel like they are having this very intense and “real” connection to history. Of course in reality, it’s a very selective and often nostalgic one. Sometimes there is a component of public education – reenactments often take place as part of celebrations commemorating historic events. But what I was interested in was the private events that reenactors hold, where the general public is out of view. There, there’s very little pretense about educating. Participants are still obsessed with “authenticity,” especially as it relates to their gear and weaponry, but in my experience at least (I participated in many private events as a Russian soldier in a Soviet unit), there’s not a whole lot of talk about the nature of war or its outcomes. They would have these battles with an end goal, and sometimes they’d relate it to a particular historic battle, the Battle of the Bulge for instance, but the outcome wasn’t actually predetermined. Most of the time I participated, the Germans won. MPB: I’m also curious: what is your understanding of the psychological motivations of the participants? Is there a general through-line as to why they participate? Are there financial costs to participate (do they pay a participatory fee)? And if there are fees to participate, does money go to something specifically? JN: Motivations vary – everyone comes to their “impression” from a different place. Typically, there are no fees to participate. MPB: Were you able to deduce how much of the battle re-enactments are a way for two sides to continue fighting, or for two opposing frames of thought not to compromise? JN: Not sure what you mean? I think in large part it’s a way for a bunch of grown men (and some women) to get together, camp, drink, smoke and play war. I believe much of it is about fantasy and play. MPB: Political-theorist Hannah Arendt said, “I’m more than ever of the opinion that a decent human existence is possible only on the fringes of society.” All of your work appears to be focused on fringe-societies. In many ways “the other” (aka “fringe societies”) is becoming more consistent in our own society. What’s a fringe society now? JN: I’ve never thought of my work as concentrating on the idea of “the other” except perhaps in Axis and Allies. With Historical Marker the work was born of familiarity – paying homage to decades of family trips out West and also to the work of a generation of photographers often associated with the New Topographics exhibition at the Eastman House in 1975. I guess with Northern Studies there was a sense of the exotic – due in large part to geographic distance and isolation – but in reality the town of Churchill isn’t all that much different from what you find in Northern Minnesota or Rural Montana. Fringe to some, but again I think familiar to many others. I’m not sure what I would consider a fringe society as it requires you to set a baseline for the norm, which is something quite difficult to do. MPB: Could you list your most important influences–visually and philosophically? JN: Tough one to answer, there are so many, and it varies depending on which project I’m looking at. Music in general is almost always an influence, whether it’s a specific band or song or composer, or a general movement – punk rock, folk, classical, etc. Frequently, I think of my projects in terms of structure the way I would a song or album. That was one of the reasons I was so keen on using Glenn Gould’s Idea of North as the foundation to build my Northern Studies series. Gould’s work is a radio documentary but it’s structured like a musical score. Also, with my most recent work, I keep coming back to a song by the British post punk band Wire – Outdoor Miner. It’s spare, simple, beautiful and mysterious in a way that resonates with me. MPB What inspires you to photograph currently? JN: At the highest level of generality, I make photographs to discover and make sense of the world and to communicate what I find with others. 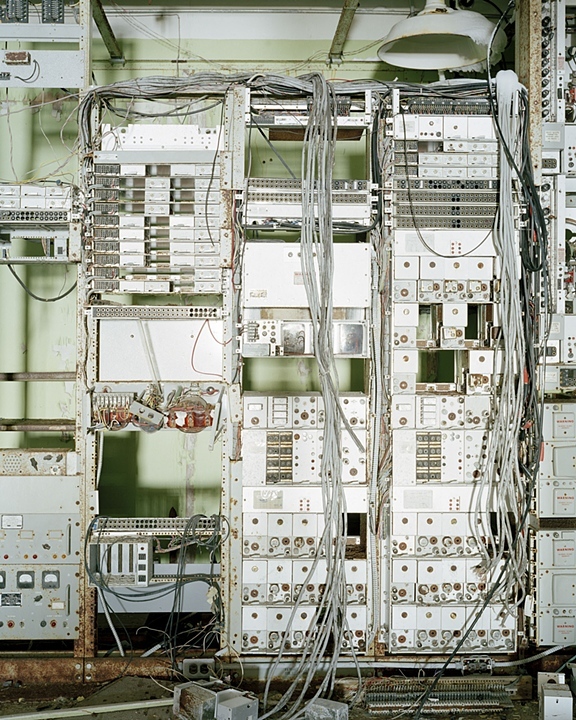 MPB: Do you have any opinions about the future of photography: technically, artistically? JN: Practice-wise I could care less if an image was made with an iPhone or with an 8×10 view camera as long as it’s compelling. Also, I’m sure digital cameras will continue to get better and the means of producing images easier – though you will still need a good idea to make something worthwhile. Predicting photography’s artistic future (in terms of subject matter) I would say that, from now until the end of time, we’ll be rehashing the same broad or general themes and ideas. What’s the quote…“the really original artist does not try to find a substitute for boy meets girl, but creates the illusion that no boy ever met a girl before”? Some might find that discouraging. But I find it comforting. MPB: What is the surprising-best quality about the “Minnesota photo-scene”? JN: I’m not sure if I see it as a scene per se, but I do think there is a strong visual arts community here. Its best quality is that it’s accessible to anyone seeking it out. MPB: Are there any dynamics you would wish could change? Or things “we’re doing,” but could do better? JN: I do think that one could argue for trying to make it (the MN visual arts community) better known to the world outside of MN. There are certainly a number of people in town whose reputation or work is well known elsewhere, but there’s still a sense that artists in the Midwest are not the same caliber as their coastal peers and that there is a provincial quality to work made here. Both in my experience are not true. MPB: Whose unnoticed photo-work are you particularly excited and engaged by and would like to find wider exposure? JN: This is a bit of a copout but there are too many to list. MPB: I’d associate you as a Minnesota photographer. Have you lived elsewhere, and if so has that experience informed your work specifically? JN: I was born in Los Angeles, but shortly thereafter my family moved back to Minnesota. But my family has had a long connection with the state of Montana, going back almost 100 years, so growing up I spent many of my summers on my grandparents’ ranch in Central Montana. That connection has and continues to inform the work I make.